Volume Discount Multi-Packs | 2M Singlemode LC SC Fiber Patch Cables | Pack Options: 2 Pack, 4 Pack, 6 Pack, 10 Pack, 12 Pack and 24 Pack. Save time and money by purchasing your fiber patch cables in quantity. OS2 LC to SC Duplex Jumpers, Riser Rated (OFNR), each assembled with Corning SMF 9/125 micron core/cladding optical fibers. Volume Discount Multi-Packs | 2M Singlemode LC SC Fiber Patch Cables | Pack Options: 2 Pack, 4 Pack, 6 Pack, 10 Pack, 12 Pack and 24 Pack. 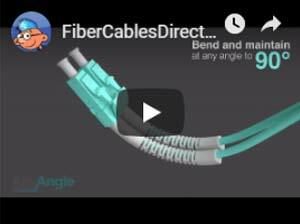 Save time and money by purchasing your fiber patch cables in quantity. 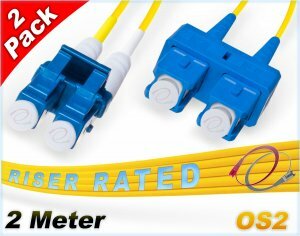 OS2 LC to LC Duplex Jumpers, Riser Rated (OFNR), each assembled with Corning SMF 9/125 micron core/cladding optical fibers. Multi-Pack of 2 Meter (6.56ft) Singlemode LC SC Fiber Patch Cables with Corning 9/125 optical fiber glass cores. Terminated using small form factor (sff) 1.25mm ceramic ferrule LC fiber patch cable connectors and 2.50mm ceramic ferrule SC fiber patch cable connectors (lc duplex and sc duplex clips included). 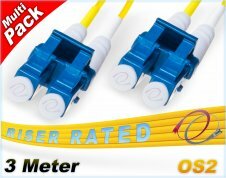 OFNR (Optical Fiber Non-conductive Riser) Riser Rated fiber patch cables for racks, shafts, risers and areas between floors Designed for long distance performance and build to last, Corning optical fiber with zip-cord. Yellow 2.0mm diameter jacket. OS2 LC/SC fiber optic networks, Fibre Channel applications, fast Ethernet, high bandwidth with fast transmission over long distances, common uses include Schools, Healthcare facilities, campuses, multi-building installations and government building. Lengths available in our online catalog for Os2 Lc Sc duplex cables (some sold in packs): 0.5 Meter, 1 Meter, 2 Meter, 3 Meter, 4 Meter, 5 Meter, 6 Meter, 7 Meter, 8 Meter, 9 Meter, 10 Meter, 12 Meter, 15 Meter, 20 Meter, 25 Meter, 30 Meter, 35 Meter, 40 Meter, 45 Meter, 50 Meter, 55 Meter, 60 Meter, 65 Meter, 70 Meter, 75 Meter, 80 Meter, 85 Meter, 90 Meter, 95 Meter, 100 Meter, 125 Meter, 150 Meter, 200 Meter, 250 Meter, and 300 Meter. Note, orders for cable lengths above 35 meters may require an additional day or 2 to ship depending on the quantity ordered. However, most orders ship within 24 hours or less.